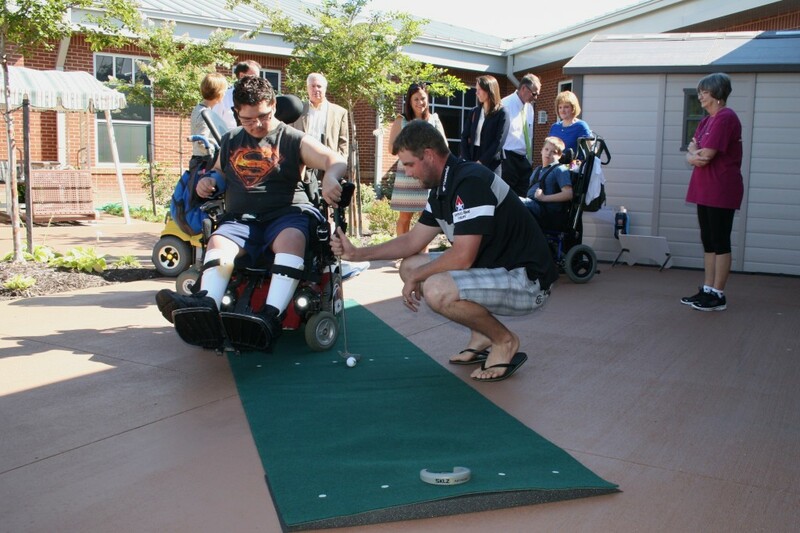 Australia’s Marc Leishman gives Jorge, a 14-year-old resident of St. Mary’s Home, a hand as Jorge tries out a putting practice green during Leishman’s visit to the Norfolk charity on Thursday, Aug. 14. NORFOLK, Va. (Aug. 14, 2014) — Aidan, Isaiah, Jorge and Salim took turns trying out their putting skills with one of the world’s top golfers by their side as they positioned their wheelchairs next to a practice green. After a few minutes, Jorge asked their companion to show them what he could do. PGA TOUR player Marc Leishman, a native of Australia who lives in Virginia Beach, obliged by sinking a 6-foot putt. “I’ve had a lot of practice,” Leishman said, turning toward Jorge with a smile. Jorge, 14, and the other boys live at St. Mary’s Home, which cares for children and young adults with severe disabilities. Leishman, who recently donated $10,000 to St. Mary’s Home from The Presidents Cup 2013, toured the charity on Thursday, Aug. 14, with his wife, Audrey, just days after playing in the PGA Championship. First on their agenda was a little bit of golf, using a new practice green purchased just with Leishman in mind and set up in a courtyard. Jorge then presented Leishman with a framed piece of artwork created by a child who lives at St. Mary’s. Jorge also brought out his sketchbook to show samples of his own artwork to the Leishmans. The Leishmans also toured St. Mary’s, learning about school, occupational therapy and other services the Home offers and meeting other residents, including Brandon and Kulquinda. They were accompanied by friends Sheri Mantoni, a support coordinator at St. Mary’s Home, and Jessica A. Hayes of Hook Law Center, who helped arrange their visit, as well as St. Mary’s CEO William C. Giermak and Vincent A. Napolitano, immediate past president of St. Mary’s Board of Directors, among others. Leishman, who is ranked 40th in the world, has been playing some of the best golf his career. He tied for fifth place at the British Open last month and followed that by finishing third at the World Golf Championships-Bridgestone Invitational. In 2009, Leishman won the Rookie of the Year award on the PGA Tour. In 2013, he participated in The Presidents Cup for the first time as a member of the International Team. The U.S. and International Teams provided a thrilling week of head-to-head competition as 24 of the world’s best golfers squared off at Muirfield Village in Ohio. The U.S Team captured The Presidents Cup for the fifth consecutive time, led by a 4-1-0 performance by Tiger Woods. The Presidents Cup is a unique golf event in that there is no prize money. Instead, competitors allocate their portion of the proceeds to charitable causes. St. Mary’s Home in Norfolk was one of 11 organizations chosen by Leishman.